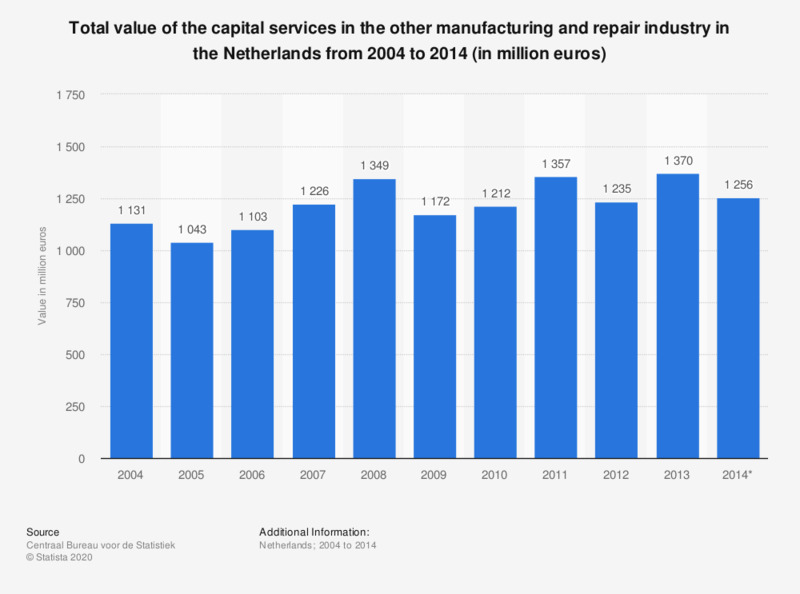 This source displays the total value of the capital services in the other manufacturing and repair industry in the Netherlands from 2004 to 2014 (in million euros). Between 2004 and 2014 the total value of the capital services in this sector varied between 1 and 1.4 billion euros. The sources defines capital services as: "the productive inputs, per period, that flow to production from a capital asset ... the value of capital services is equal to the costs of capital services." This category includes capital stocks, oil and natural gas reserves, inventories, agricultural land and land underlying buildings. This sector includes the production of furniture and other products not mentioned before as well as the repair and installation of machinery and equipment.